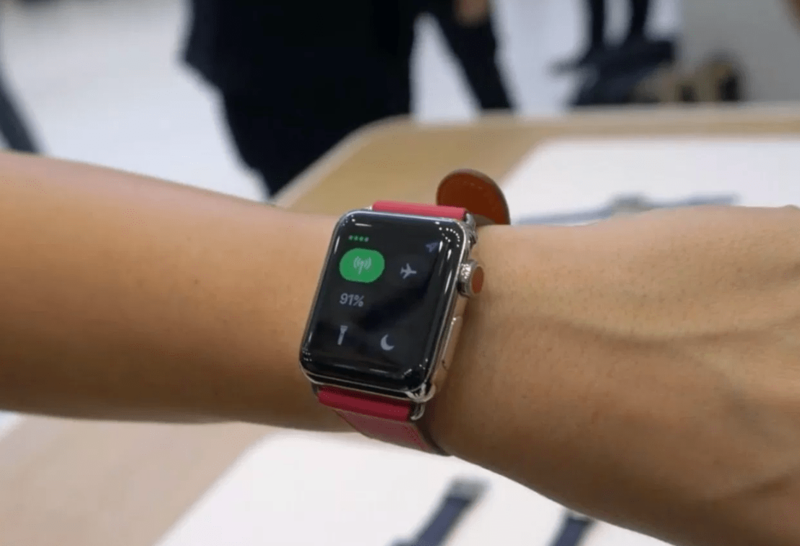 Apple Watch Series 3 LTE’s First Impressions: The Watch With The Red Dot: It is interesting that the red dot is a symbol of adornment in Indian culture. Apple has launched its latest Watch Series 3 with cellular support in India, and it does stand out compared to the existing Wi-Fi variant currently on sale in India. The one visual differentiator between Series 3 LTE and the ordinary Series 3 is a red dot in the digital crown. Magic is happening in a Hood. In what it is claiming as an industry first. Apple has found a way to use the display as an antenna. You don’t need antenna lines anymore. It blends in without taking away or adding any elements to the product design language. On day one of using the new Apple Watch Series 3 LTE. I am coincidentally finding myself in a situation where I have to rely on the cellular function. On a trip to New Delhi, my Vodafone connection gives way. Seamless roaming was relative. Or I guess I missed out on some luck and favor from the networks. I put in a temporary Airtel SIM into my phone, which resulted in two things. I finally got latching on to a home network. I can also place calls that were intelligible. But I was not reachable to the world. I have not shared the number yet. But the good thing was I was not switching, and searching for networks anymore. When things were seemingly running fine, my phone battery ran out. It was a choice between two continuing with my existing Vodafone number with horrible network quality, or connecting with an Airtel number that was serving me well, but no one could reach me. I was stressing because I have to rush to the airport. I have to coordinate with the cab driver, and I would jotting his number down in my journal since I would sense my battery was low. In case you are wondering, no I did not carry the charger or a power bank with me. Initially skeptical, I tapping on dialer icon on the Watch screen. I am dialing in the driver’s number, telling him where I was, and he is to pick me. Since I have the same Apple ID signing in, it is retrieving my address book, and I did not miss the old number. Only no one can reach me, while I can call anyone I wanting to. During the ride, I am calling up another friend who I have to meet in a path. He is surprised to see the new number flash on the screen. But when he is hearing me at the other end of the call, and I explains the situation. He was impressing, not able to differentiating call quality between a phone and a watch. Even I found the process a rather smooth one. But that can also probably because I am in the state of emergency in a different city. Potential of the connectivity independent of your phone. In addition to the ability to call, you can also use apps such as Uber and Ola, which comes in handy. All you need to do is tap the app, select which cab you want a couple of the swipes, and you are ready to go. Besides cab services, features such as Apple Music and Siri is ensuring that you can seamlessly connect your Apple Watch Series 3 Wi-Fi + Cellular with a pair of the Bluetooth speakers and stream music without looking at your phone. Independent of your phone. On the other fronts, it is a replica of the Apple Watch Series 3 Wi-Fi. The past few days of using Apple Watch Series 3 Wi-Fi + Cellular has hassle-free. The Watch with LTE support is currently available with Bharti Airtel and Reliance Jio with a price tag of Rs. 39,080 for the 38mm variant, and Rs 41,120 for the 42mm option. So, stay tuned for a more detailing review here at BGR India. So, these are the points to describe on the Apple Watch Series 3 LTE’s first impressions The Watch with the red dot. Please comment your suggestions on the Article as mentioned above.